A couple of years ago, when I was starting to flesh out the story for my tenth novel, That Girl From Nowhere, my husband mentioned a story he had read on babies sleeping in cardboard boxes. I’d being thinking a lot about babies being left in cardboard boxes on the steps of churches and hospitals from my search for the story which centred a lot around adoption and children’s homes. After talking at cross purposes for a while, my husband explained to me about the Finnish baby boxes, where the Finnish government provides every new mother-to-be with a box full of baby essentials (clothes, toys, books, nappies, etc). The box also comes with a mattress so that the baby can sleep in the box for the first few weeks of their life. The practice for giving these baby boxes originated in the 1930s for low income households as a way for them to be able to provide everything they need for their children and in 1949 it was extended to all Finnish families. My husband had mentioned that young Finnish women who lived abroad were asking their mothers to send them similar boxes, and that this story was a popular read because then the Finnish government sent a baby box to the young royals Kate and William for their first child. This story came at a perfect time for me because I’d been searching for a way to link the main character of That Girl From Nowhere, Clemency AKA Smitty, with her birth mother. I wanted an unusual way for someone who had no knowledge at all of their birth family to have an everyday connection with her birth mother. There was the option of the birth mother having left jewellery (Clemency is a jewellery maker) for her to be given on her 18th birthday, but I wanted something that was always there throughout Clemency’s life. I’ve mentioned before that the original incarnation of That Girl From Nowhere was a book called Where I Found You. That story was centred a lot around Clemency’s obsession with butterflies – she had recurring dreams about them and was obsessed with pictures of them in every-day life. 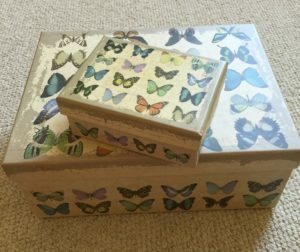 When I had the conversation with my husband about the Finnish baby boxes, another piece in the puzzle that was creating the character and background of Clemency fell into place: I decided that her birth mother had known a Finnish woman who told her about the baby box tradition and so she decided to create a box for her baby and decorate it in butterflies. 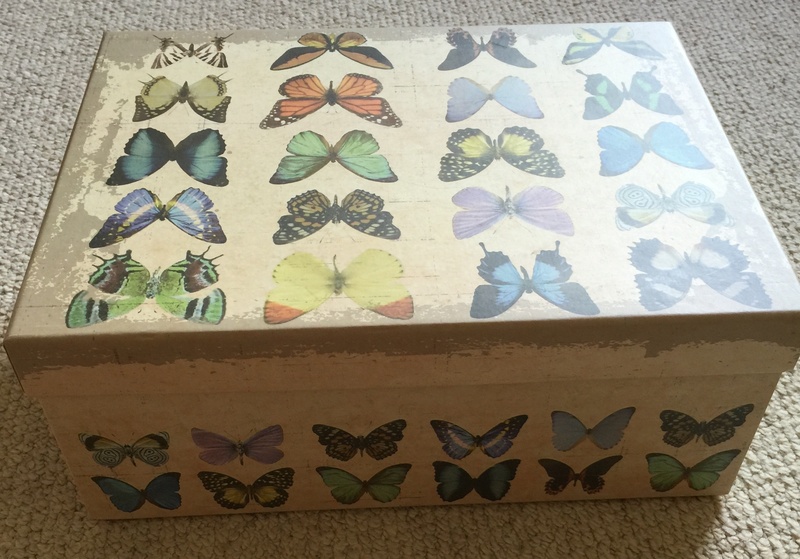 This box is quite important to Clemency, who keeps her most precious photographs in the box throughout her life, and when she finally meets a Finnish person who seems as obsessed with butterflies as Clemency she realises she has accidentally stumbled across the person who knows all about the butterfly box she used to sleep in and what happened to her birth family. When I’m writing, I find it helps to have visual reminders around – what I’m writing about may not be exactly the same but it is a trigger of what I can see in my mind when I’m writing the book. I really loved writing That Girl From Nowhere, and finding out about the baby boxes was a huge part of that. If you want to find out more about the Finnish baby boxes, have a read here. If you want to read That Girl From Nowhere, you can read an extract, here and you can buy it here, here and hereonline.